This picture was taken 3 hours after it was done, I'm over the moon the way it turned out! This is my memorial tattoo for my Dad who I miss dearly. 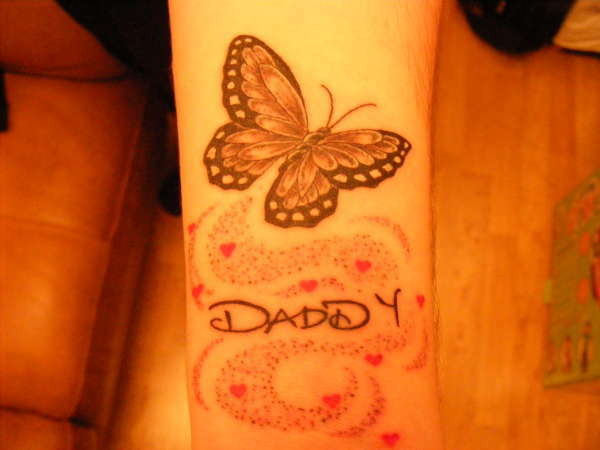 It has 10 love hearts floating because he passed away on the 10th September 2008 and I chose a butterfly because it means rebirth and that was also the last thing my Daddy bought for my daughter's bedroom. And the Daddy is his hand writing that they got from a card he got for me, so a piece of Daddy with me alway's! What a beautiful memorial BeBe! I am going to get one done for my Dad, a sunflower on the inside of my wrist, and one for my Mum, a Freesia on the other wrist...I miss them so much. Tattoos are wonderful when they mean something. WOW, a beautiful memorial tat! I don't even got words for how great this is. It has so much meaning... wow. I love it. I love this tattoo and all the thought and love you put in to the symbolism. It gets a 10 from me.